Group exhibition from local and international artists, featuring various artforms such as abstract painting, mixed media, photography, video art, performance art, etc. Curator Nicole Bartos. 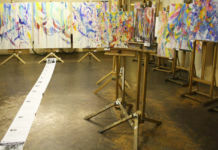 Over 24 British and international artists took part in this project during 2008, as part of the Independents’ Biennial. This year some of those artists will join again, next to the newly selected artists. A festive season again, starting with the sunset watching meetings throughout late August and early September, and finalising with the exhibition.